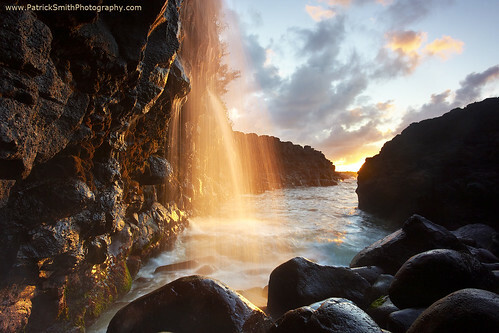 Golden Falls - Queen's Bath, Kauai, Hawaii, a photo by PatrickSmithPhotography on Flickr. Sorry I haven't been around much lately. I'm writing an app for apple and Android devices about photographing the California coast! I'll be done in a couple of months. I have many new photos of Kauai to share. For this, I had to bail out several times when bigger waves would strike. This place could be extremely dangerous during the winter and I DO NOT suggest you try this during big surf!!! From a trail near the Princeville hotel, you gain access to some incredible coastal scenery including a large lava swimming pool called "Queen's Bath" but on this evening I wanted to capture these falls as they enter the ocean as they are lit by the last rays of the sun. The falls do not show up well in photographs unless the golden sun is striking them during the summer. I had to get into a small area under a lava ledge and stand on extramely slippery rounded rock at low tide to get this view. The best time to shoot this (because of the angle of the sun hittin gthe water) is probably the summer.